Trees can grow in such a manner that their physical structure can no longer support their own weight. This is particularly common in mature multi-trunked trees and trees with open canopies. Failure of a large branch or trunk can result in property damage, personal injury, or the decline of a tree’s health. 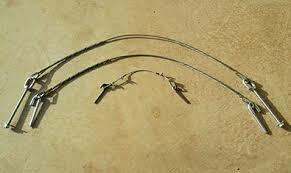 Cables and bracing rods are tools arborists use to protect or improve the structural integrity of trees. As a tree grows, the angles that exist among limbs determine structural integrity. Branches having a wide angle of attachment or a pronounced “U” shape will be stronger than that of a narrow “V” shape. When a tree is young, the stress placed on a narrow angle of attachment is usually minimal. However, as the tree matures the weight of the canopy and the additional load created by winds, snow, or wet foliage may be more than the attachment can support. ​ The installation of cables and bracing rods, along with pruning to reduce end-weight can reduce the likelihood of a structural failure. Properly installed cables help to redistribute structural stress, and bracing rods can provide support to branch attachments deemed weak. A combination of cabling and bracing can successfully address existing splitting limbs and trunks. Our professionals can determine if your trees can benefit from the installation of cables and bracing rods. 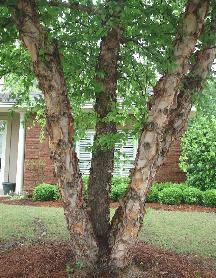 ​ Trees with trunks that have narrow angles of branch attachments may develop vertical splits. Such cracks are often a result of structural stress or storm damage. When such splits are found, immediate attention is needed to prevent complete failure. Your arborist can advise you as to whether the tree should be removed or if cabling and bracing is a viable alternative. If the latter is an option, selective pruning, the installation of cables, and the proper placement of bracing rods can add years to the life of a damaged tree without affecting its aesthetic appeal. By their very nature, multi-trunked trees are subject to failure. Because each trunk competes for canopy space, the limbs and foliage grow away from the center of the collective trunks, placing the weight load on one side of each trunk. This factor, plus the competition for root space, results in the failure of multi-trunked trees at a rate greater than trees with single trunks. Failure of any singular trunk can create a wound at the collective base that heals slowly, creating a site for opportunistic insects and diseases. Cabling can substantially reduce the likelihood of structural failure. Every cable installation is tree specific. We can determine the best cabling arrangement for multi-trunked trees.